I bought a troop of A-13 cruiser tanks for my 15mm BEF forces. 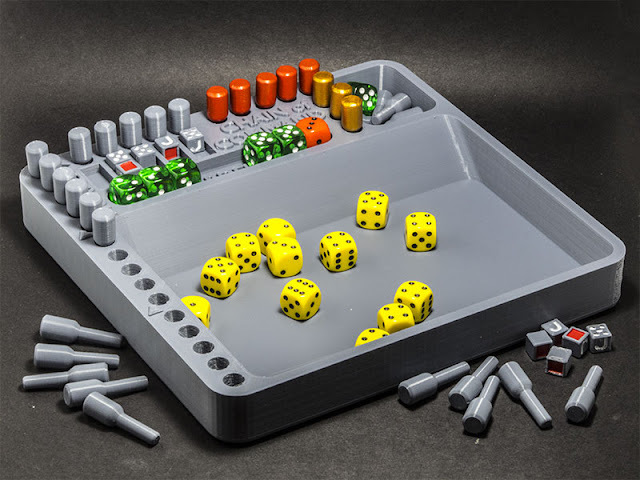 The snap-together kits are by Zvezda, for their Art of Tactic game, and were sourced from PSC for about four quid each. 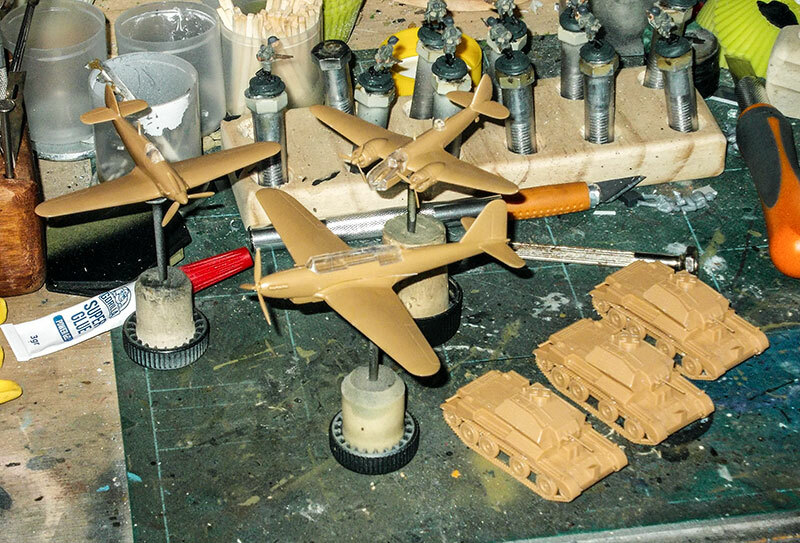 They're moulded in a tan brown plastic — I've photographed them here after spraying them with Khaki Green #3 over a black primer. 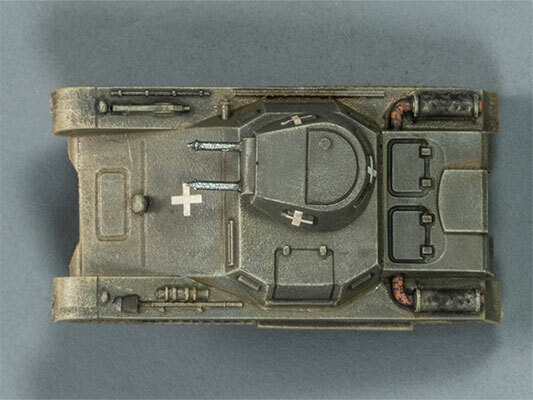 First, due to the construction of the turret, there's a fairly prominent seam running across the front plate that purists will probably want to address with filler. Whether I'm all that pure is yet to be decided. The headlight isn't moulded into its housing, so it will have to be painted in. There is no aerial mounting provided at all, so if one is desired it will have to be scratch-built or otherwise sourced. 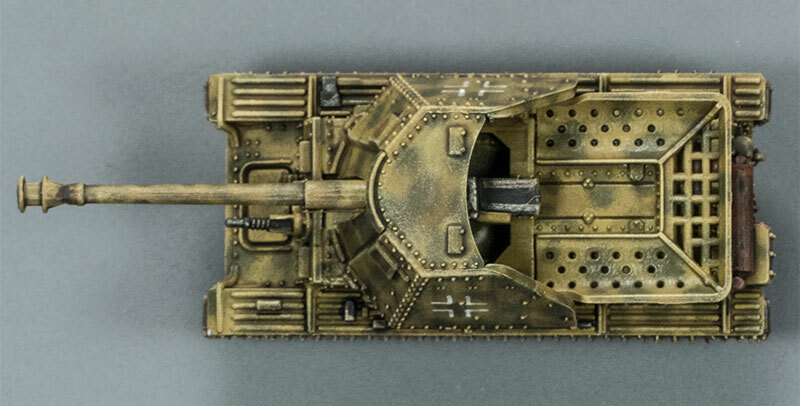 The 2pdr gun barrel is moulded extremely finely and looks to me as though it might be a bit fragile for the hurly-burly of wargaming; I will probably replace them at some stage with turned brass barrels, as I usually do with my resin models. Aside from these fairly minor problems, they're excellent little models. I haven't checked them for absolute dimensional accuracy, but they don't look out of place next to my older resin/metal cruisers. I've glued lead slugs inside their guts to give them a little bit of weight, as the bare plastic models could easily blow away in a slight breeze. Although they really do snap together and stay together (Zvezda's tooling is excellent) I've glued everything just in case. I'm pretty happy with them; they're really excellent value for money and provide a welcome reinforcement to my plucky BEF. Here's the diminutive 1:100 scale Panzer 1A from Minairons, alongside a couple of 15mm Battlefront Germans. It's unlikely to do very well on any battlefield where there are actual tanks to fight, but as a mobile machine-gun pillbox it could be quite useful. I think that for 1940 I should probably be using the Panzer 1B or C, but they all look pretty similar and have pretty much identical stats, so this 1A can stand in for any of them. They come five to a box; I got mine from The Plastic Soldier Company. 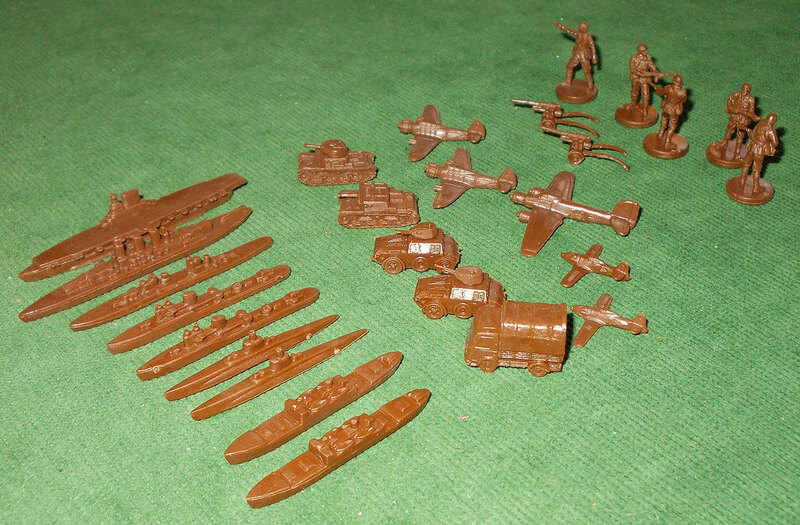 Today's mail brought me a bunch of Zvezda kits (via PSC) to bolster my 1940 BEF forces. There's a troop of A13 cruisers, and some air support at last — a Hawker Hurricane, a Bristol Blenheim, and in front, a Fairey Battle. Unfortunately the Blenheim is 1:200 scale, while the other two aircraft are 1:144, but for my wargaming purposes that's not too big a deal. I'd rather it was 1:144, but it will do the job. The very next day, these arrived, also from PSC. The Panzer 1 is by Minairons, and comes in a box of five. 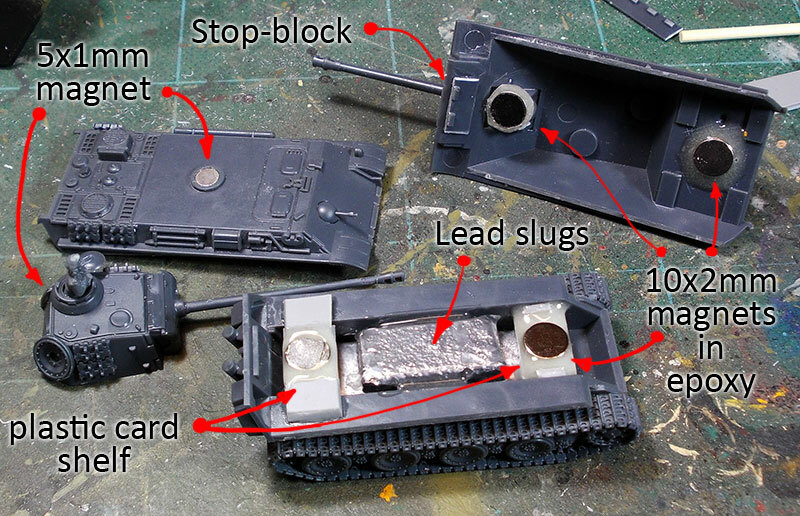 It's a quick and easy kit to assemble, but not without its issues. The hull back plate isn't shown clearly in the simple assembly instructions, and I'm not sure if I've got it the right way up. I'll have to take to the internet for a bit of research before I complete the rest. 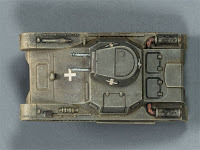 The turret has a peg that sits in a raised ring on the hull top, but it's not at all a tight fit, and if the model is bumped the turret will just fall off. I've removed that peg-mount, and magnetized the turret. The 1:144 scale Messerschmitt is a BF109F, by Zvezda. I would have preferred a BF109E, but couldn't find one, so this will have to do. 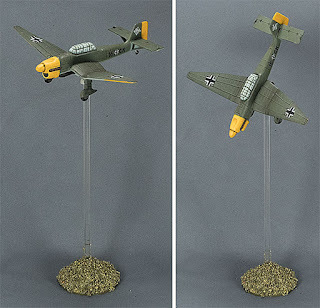 Next to the Hurricane, the Me109 really does look tiny — which it was. 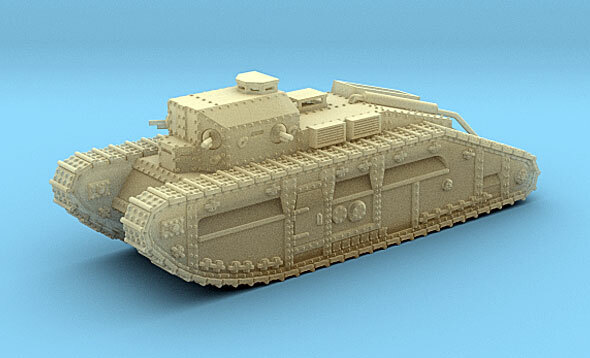 Back to building 1:100 scale tanks for 3d printing. This is the British Medium C Hornet. I don't quite recall what it was that spurred me on to design this. It was something on the internet, that much I know. I just learned how to save a bundle of money on flow improver, thinner and retarder for acrylics through the Magic of the Science of Glycerine. Thinner — water 66%, isopropynol 33%, and then just a few drops of glycerine. Retardant — maybe 5% water, then add half and half of the remaining volume in glycerine and glycol. Apparently you can just use straight glycerine, but the addition of glycol really slows down the drying time for acrylics for blending and what-not. Info courtesy of Luke's Aps on Youtube. Lots of stuff there about saving cash on terrain-building and what-not. I was trawling through AliExpress, actually looking for some board games, and came upon these little plastic miniatures. They're not to a constant scale — or at least, not between different unit types. 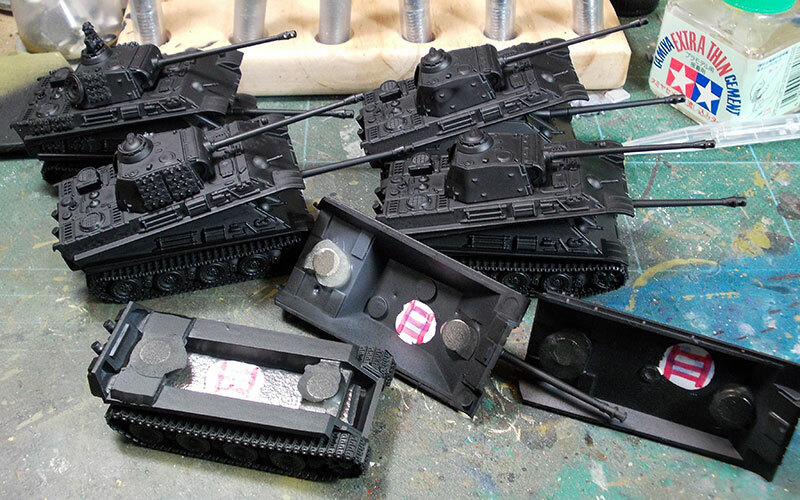 The AFVs, for example, look as though they scale with each other, and likewise the ships and the aircraft, but I haven't done any measuring to confirm that. They're surprisingly detailed little miniatures. I assume they were originally intended as playing pieces for some board game or other, but I don't know that for sure. They appear to be WWII Italians. I don't know what I'll do with them, but no doubt I'll think of something. Yet another distraction from the main thrust of my wargaming, I'm afraid. I got a free box of Battlefront plastic Panthers and/or Jagdpanthers a while ago, when I subscribed to Wargames Illustrated. 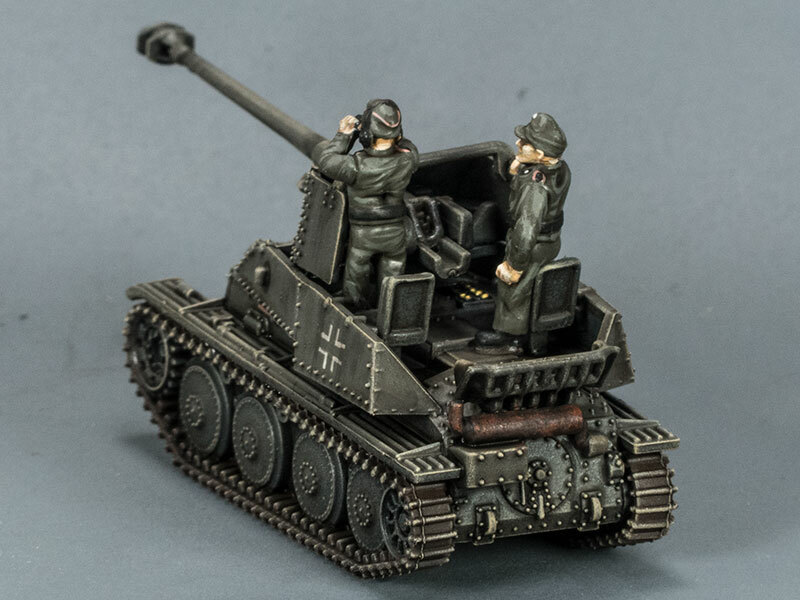 They're the wrong bit of WWII for my purposes, but they were the most attractive of the available subscription rewards, so they're what I chose. 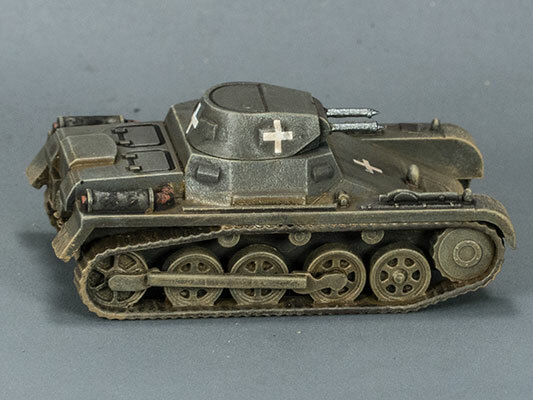 There are sufficient bits to build five vehicles, either Panther Ausf. 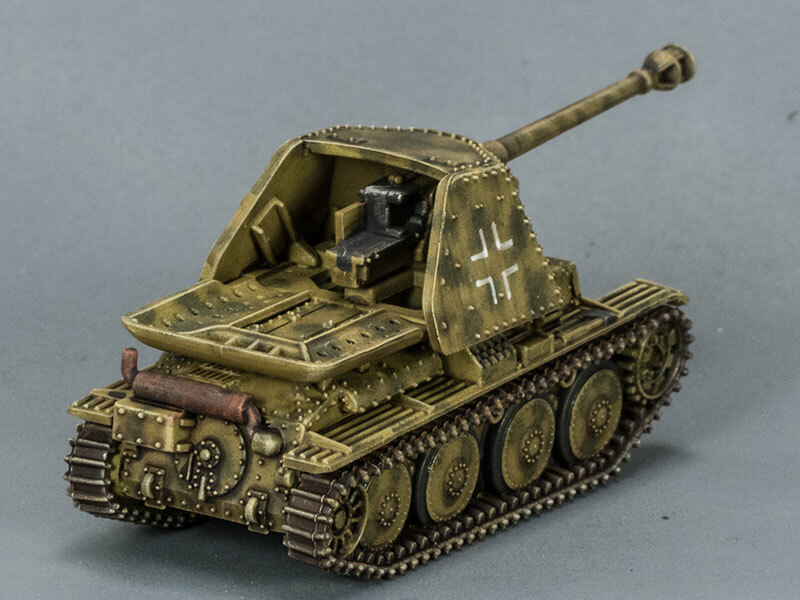 G or Jagdpanthers. Unless, that is, you have vast supplies of cheap rare-earth magnets from China. Which I have. So, instead of submitting to The Man and being forced to choose between tanks and tank hunters, I'm having a go at magnetizing the hull tops to swap on to the five available hull bottoms and tracks. It's a bit of an involved process because there aren't really any locating lugs keeping the upper hulls in the right place, so the magnets will have to do that job, which means that magnet placement will need to be fairly accurate. I'm perfecting my process on this one set before going ahead and doing the other four. I intend, eventually, to have a magnet at front and rear. I think I'll be making liberal use of epoxy putty to make stands for magnets to sit on, but really I'm just making this up as I go along. After a fair amount of faffing about, I hit upon a system that works well. The first thing I did was to glue little stop-blocks where the hull fronts, top and bottom, meet. I used bits cut off the schürzen, which I wasn't planning on applying otherwise. 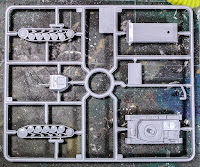 Rather than squishing epoxy putty around magnets inside, which didn't work all that well at all, I instead built little shelves for the magnets in the bottom hull out of plastic card and slathered them and their magnets in gobs of epoxy resin. Once they were cured, I covered the magnets in masking tape (to keep them free of the next lot of epoxy), put the upper-hull magnets on the bottom-hull magnets, and slathered them in gobs of epoxy. Then it was a simple matter of putting on the hull tops and turning everything upside down, letting the epoxy drool on to the inner hull-top to secure the magnets in the right place and orientation. 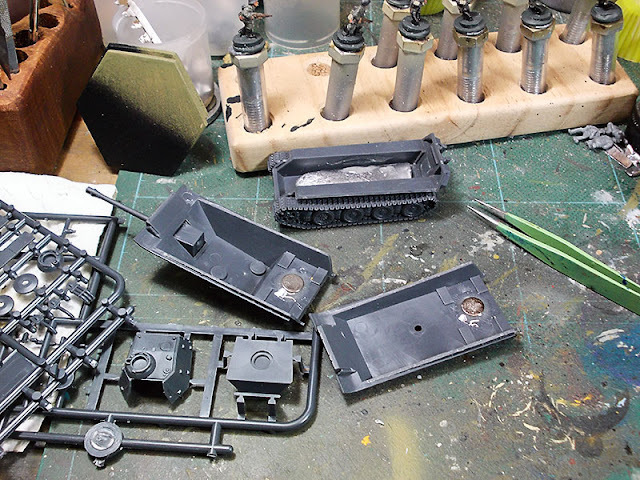 It's not a fantastically quick process, and it is quite profligate of magnets (six magnets per set of hull parts, plus two more for the Panther turret), but it's not unrealistically fiddly and lends itself quite well to production-lining. Four more sets left to do. 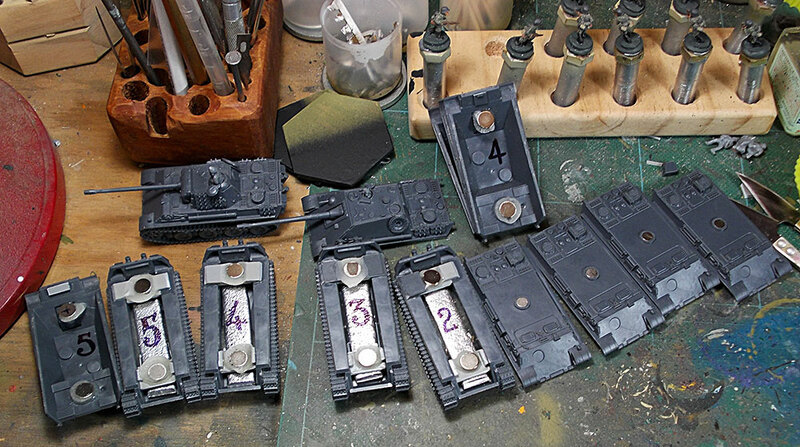 All the hulls and turrets are now magnetized all up the wazoo, ready for final assembly and painting. I've numbered the matching sets, just in case I got some attachment points out of whack, but as it turns out I've been accurate enough that everything is interchangeable with everything else. So, score! I've got them all primed and numbered. 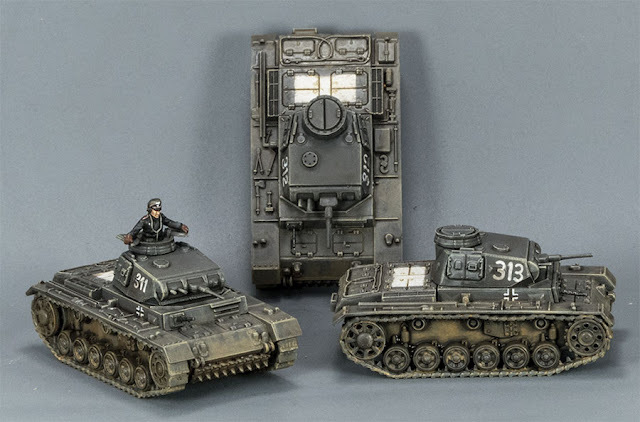 I doubt that I'll get on to final painting any time soon; as I mentioned before, these vehicles are from quite different part of WWII than I'm primarily interested in. However, it's been an interesting and useful experience. Battlefront on the left, Zvezda on the right. I just got an order of three Zvezda 1:100 scale Panzer II. Six if you count the stupid flag. It's a clip-together kit for their Art of Tactic game, and comes as just five pieces, so it's exceptionally quick and easy to slap together. I bought them from Mighty Ape, and they cost about ten bucks each — that's just a little more expensive than they would have been from The Plastic Soldier Company, after postage had been added. However, after PSC got my hopes up, they dashed them when it turned out they had none in stock, so Mighty Ape it was — which had the advantage that the delivery time was a whole lot quicker. 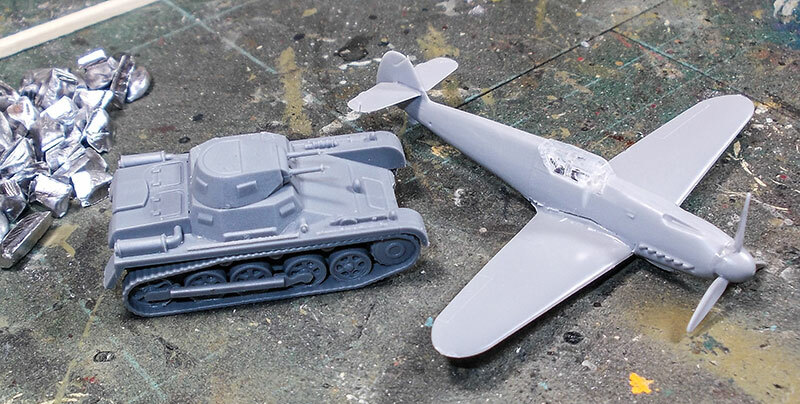 Shown here alongside a Battlefront resin-and-metal model, you can see that it's perceptibly smaller. 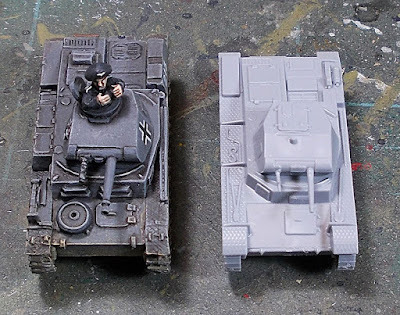 I don't know which one is more dimensionally accurate, and I don't much care since they're just gaming pieces and not part of a diorama; the relevance to me is that I probably won't want to be mixing them within the same unit. Note: the Zvezda model is too small for 1:100 scale. It should be 48.1mm long; in fact it is only about 43mm. It looks like in that case Battlefront's model is about right, judging by eye. 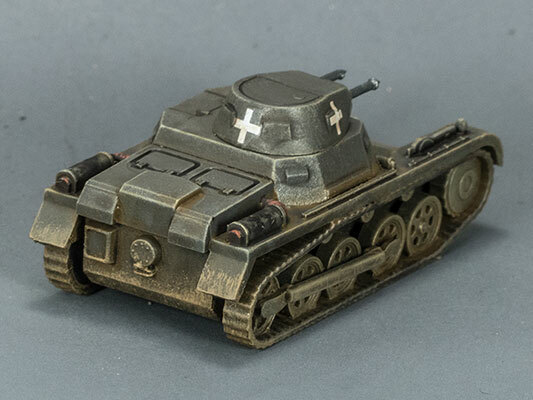 The detail on the Battlefront model is much more pronounced than Zvezda's injection-moulded offering, but the limitations of metal casting means that the gun barrels and tracks are very much chunkier than they should be in scale; they're a lot finer on the plastic vehicle. 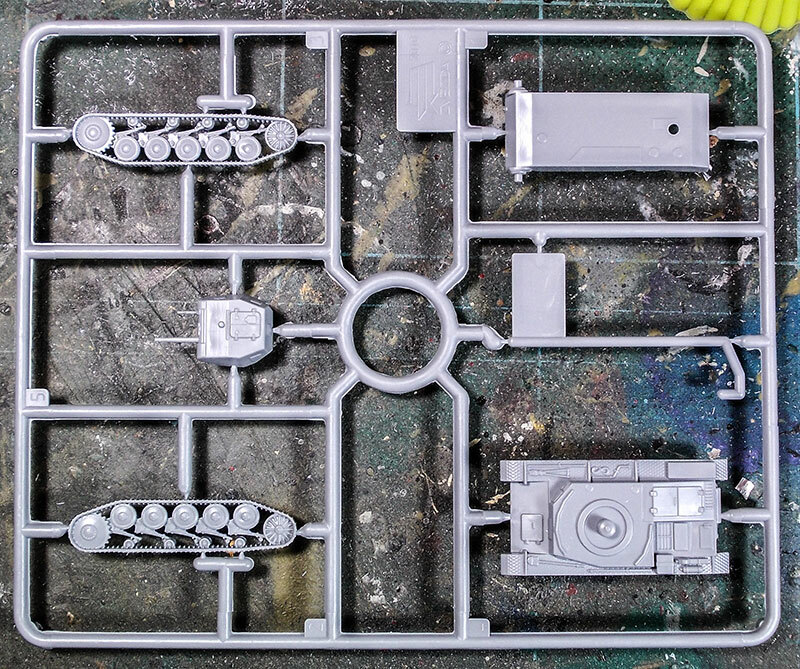 Adding a commander figure to the Zvezda kit would require quite a bit of surgery, since the hatches are moulded closed and the turret is pretty much a solid bit of plastic. I got the three of them painted up and ready for the tabletop. I can't say they're my best work, but they'll do the job. 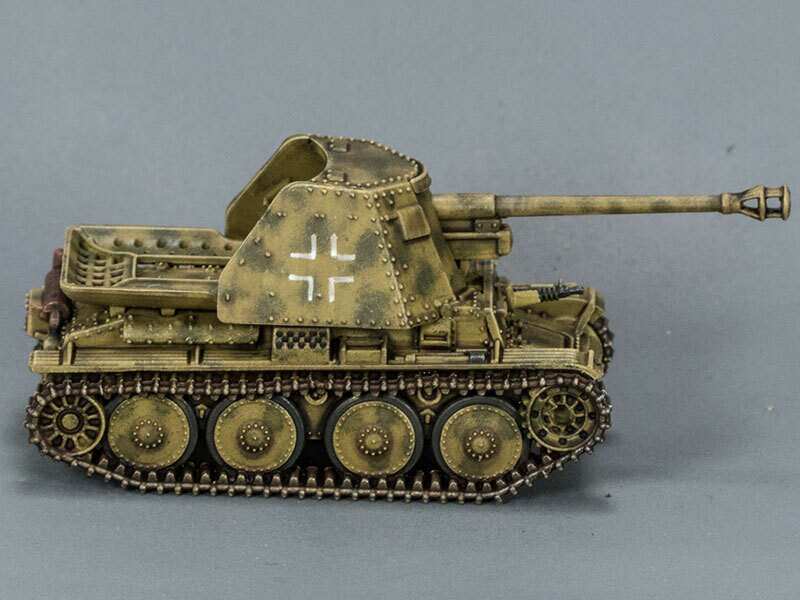 This is the other of the Marder options from the PSC 15mm Panzer 38t box, the Marder III Ausf. H with the PaK40 75mm anti-tank gun. 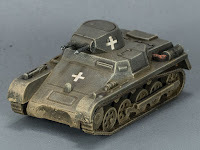 This has been a favourite WWII vehicle of mine since childhood, when I built a 1:35 scale Tamiya kit of it. 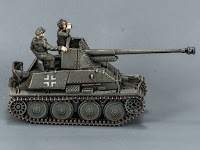 The crew for this model are problematic, because the figures offered on the sprue that look like they might be meant to go along with the vehicle are kind of crappy — very flat poses, weird proportions, and they don't really seem to belong no matter where on the vehicle I place them. I'll leave it crewless for the moment and see if I can find something a bit better. 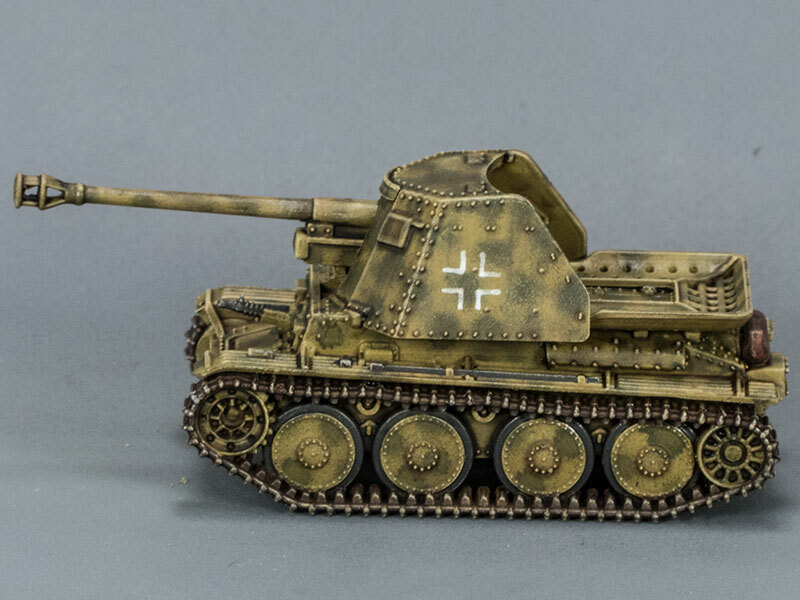 Here's one of the options presented in the PSC 1:100 (15mm) Panzer 38t box set. 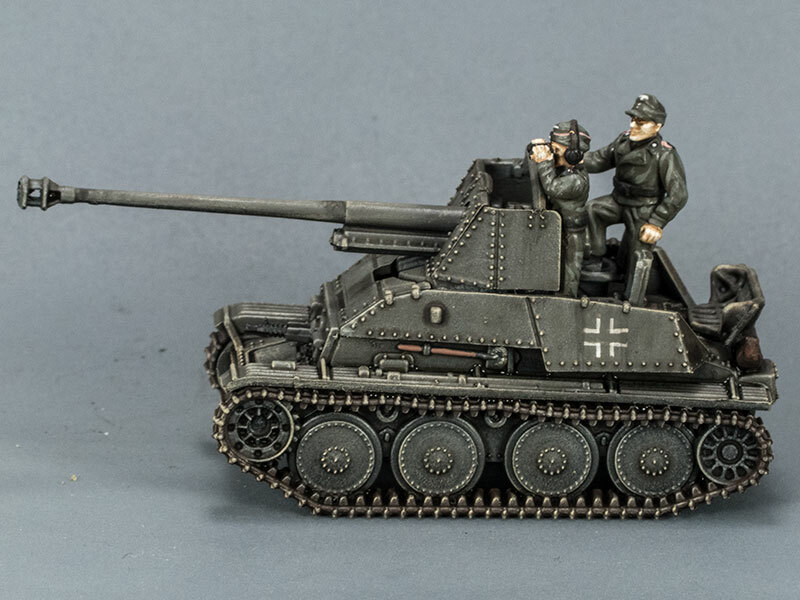 It's a Marder III (Ausf.139), mounting the PaK 36(r), a captured Soviet 76.2mm gun re-chambered for the standard German 75mm anti-tank round. As far as I know, the Marder SPAT conversions weren't produced until early in 1942, so being painted in grey would mean that this was one of the first to go into service, before the changeover to dunkelgelb as the base colour for German AFVs. There were about 350 built, in total. I've used a new colour as the basic grey this time: VMA 72.128 Grey Violet, which is a warmer and slightly darker grey than VMA 71052 German Grey, and just a fraction lighter than my current favourite for Panzer Grey, VMC 866 Grey Green. 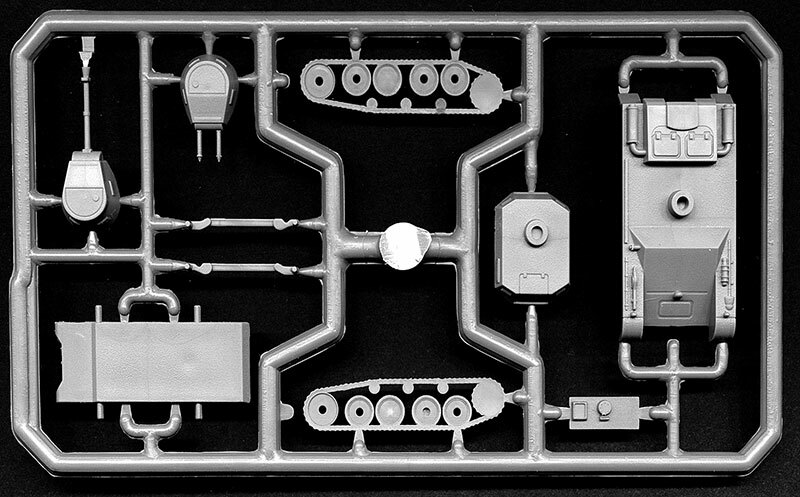 The construction instructions included with the kit are quite incomplete when it comes to this variant. I had to make a guess as to where some parts were meant to go after looking at some pictures on the internet. I think I got it pretty right. 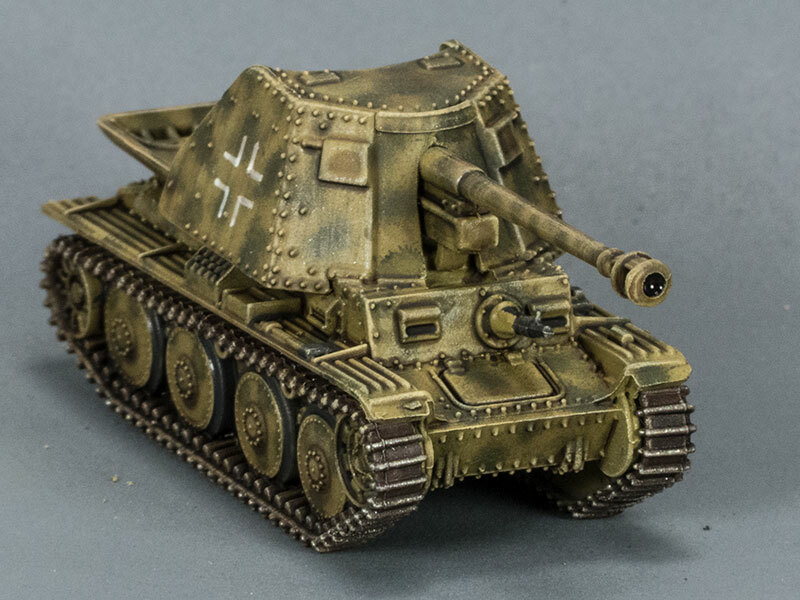 Having got aeroplanes out of my system (for the moment), I've gone back and finished off this unit of Panzer III F tanks with their mighty 37mm door-knockers. Or rather, mostly finished off, since as usual after taking a photograph I've noticed some bits that I've forgotten to paint. 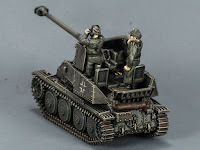 These are 1:100 (15mm) models from The Plastic Soldier Company, and very nice they are too. 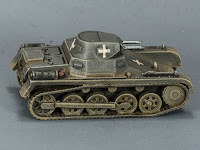 If they have a fault, it is that, due to the way the tracks are moulded, they lack detail exactly where it's most needed — at front and rear of the tank, where they pass over the sprocket and idler wheels, and where they're most visible. I've glued a slug of lead inside each one to give them a bit of weight, since otherwise they're so light a stray breeze could blow them off the table. 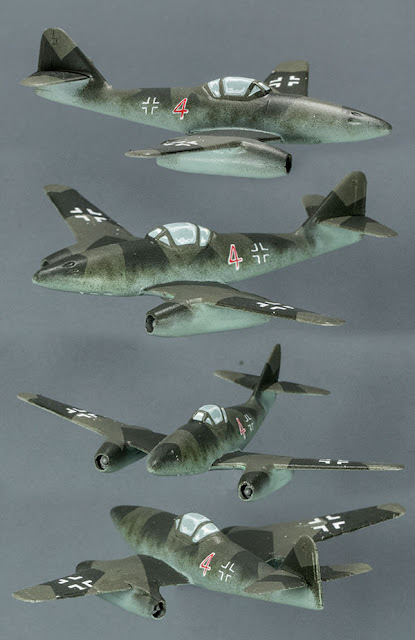 I finished off the old Revell 1:144 scale Me262 kit I started a few days ago. As I suspected, the decals just crumbled when I tried to use them. I got a couple on to the wings in pieces, but ended up having to paint over them anyway as they were so ragged and cracked. 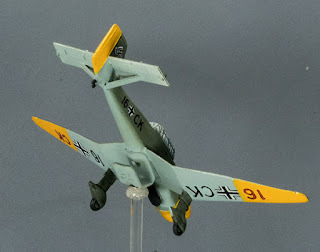 Rather than mess around like that again, I just went straight in to painting for the fuselage markings. 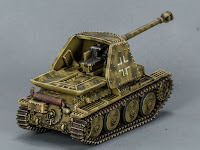 I can't say that I recommend these Revell kits. They're pretty terrible, and require a considerable amount of work to make them look half-decent. 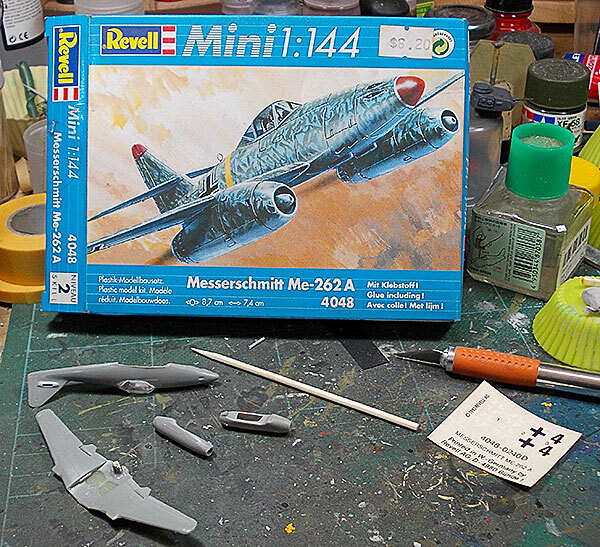 Continuing with my distraction from the troop of Panzer III that I should be painting is this Revell 1:144 scale Me262 that I bought at the same time as the Stuka I've just finished. There's a copyright note for 1992, which would have been about when I bought it, so it's been sitting around, unloved and neglected, for a good long time. I have to say, these Revell 1:144 aeroplane kits really are rubbish. I've had to carve off all of the locating pins, because none of them actually align properly with their sockets. There are huge gaping cavities around where the wing assembly joins to the fuselage which will need a lot of filler. Actually, there are huge gaping gaps around pretty much every seam. I don't have very many hopes for the decals, being as old as they are; I suspect they'll just fall to pieces. But we shall see. 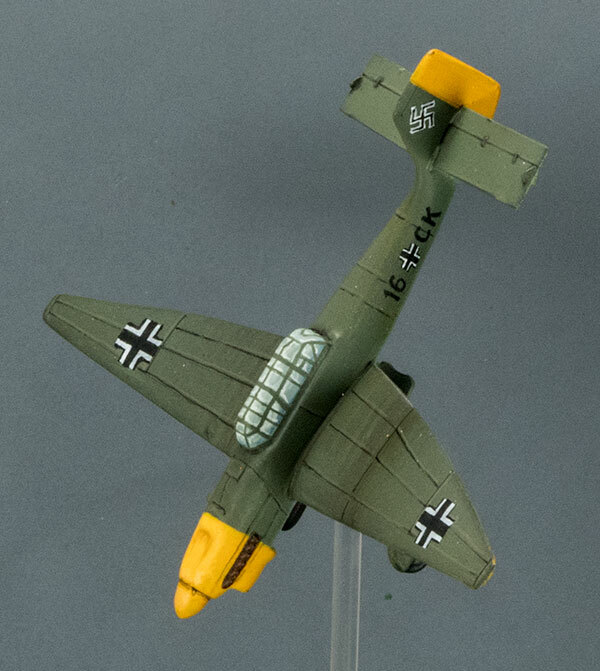 Added to all that, it's really a pretty pointless build for me, since the Me262 didn't see service until the opposite end of the war from the bit I'm mainly interested in for gaming. Ah well. 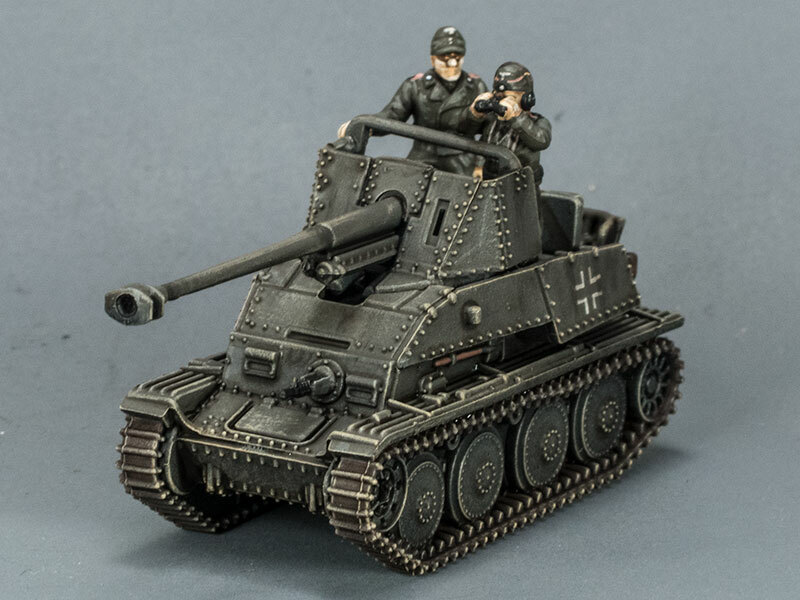 Finished and ready to start an illustrious career on the wargames table, this is an ancient, and fairly terrible, Revell 1/144 kit. It's missing its dive-brakes and rear machine-gun. I added a steel tab beneath that allows the aeroplane to be set either in level flight or in dive mode on a magnetic flight stand. Considering how crappy the start point was, I'm pretty pleased with the way this has turned out.